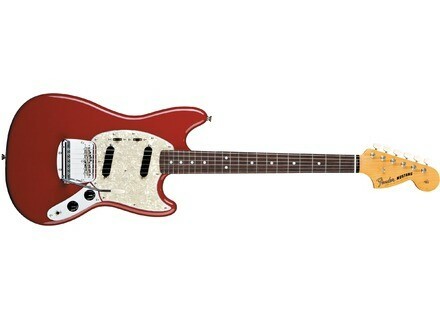 Classic '65 Mustang, Other Shape Guitar from Fender in the Mustang series. Fender is presenting a new series of "Mustang" amps, Mustang I & II. Mustang I is a 20-watt closed-back combo with an 8” Special Design speaker. It contains 24 on-board amp presets with tones from "vintage Fender sparkle to outrageous modern metal distortion," and a bank of 24 built-in effects including chorus, flanging, phasing, tremolo, vibratone, step filter, reverb, echo, octaver and more — 12 modulation effects and 12 delay and reverb effects in all. It’s designed to be good for practice and jam sessions, and an 1/8” headphone jack is here to let you play loud, even if only for yourself. Further, you can connect Mustang I to your computer with free Fender FUSE software. You can access on-screen parameter control, deep editing, additional effects, unlimited preset storage, online preset swapping with the Fender FUSE community, and free Fender artist presets. An optional single-button footswitch controls two quick-access presets, Fender says. Mustang II is a 40-watt closed-back combo with a 12” Special Design speaker. It contains 24 on-board amp presets with tones from "vintage Fender sparkle to outrageous modern metal distortion," and a bank of 24 built-in effects including chorus, flanging, phasing, tremolo, vibratone, step filter, reverb, echo, octaver and more — 12 modulation effects and 12 delay and reverb effects in all. It’s designed to be good for practice and jam sessions, and an 1/8” headphone jack is here to let you play loud, even if only for yourself. Further, you can connect Mustang II to your computer with free Fender FUSE software. It includes on-screen parameter control, deep editing, additional effects, unlimited preset storage, online preset swapping with the Fender FUSE community, and free Fender artist presets. An optional single-button footswitch controls two quick-access presets. For more details on the series, visit www.fender.com/products/search.php?section=guitaramplifiers&series=Mustang%84%A2. Budda Budwah Wah Pedal Budda has updated and improved the Budwah. Vox Mini 3 VOX Amplification has added the Mini3 to its amplifier lineup, combining renowned VOX modeling technology, flexible battery or AC power, and onboard features. Eastwood Warren Ellis Signature Tenor Guitar After 12 months of collaboration between Eastwood Guitars and multi-instrumentalist Warren Ellis (The Dirty Three, Nick Cave and the Bad Seeds, Grinderman) the new Eastwood Tenor Guitar is ready for release.